Thames Water has signed contracts worth a combined £200 million with suppliers to find and fix “more leaks than ever before” across London and the Thames Valley. The water company, which has previously been heavily criticised for its poor leakage performance, signed the agreements at its head office in Reading this morning (18 March). 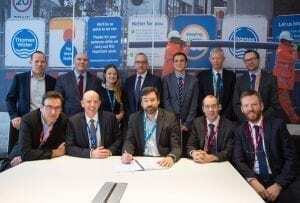 Lawrence Gosden, chief operating officer at Thames Water (pictured front row, centre) was joined by senior leaders from each of the contract partners. The contracts, awarded for an eight-year period, are expected to save the equivalent of 172 Olympic swimming pools of water every day, according to Thames Water. Teams will use a range of leak detection methods including traditional sound tests, acoustic logging and desktop modelling to accelerate Thames Water’s work to reduce leakage by 15 per cent by 2025 – a challenge Ofwat set the sector. Thames said the new contracts will enable it to target higher leakage savings for 2019/20 from 370 million litres of water a day (mld) saved to 430 mld – an increase of 16 per cent. As part of the new contract, due to begin on 1 April, suppliers will be required to attend quarterly innovation forums to share the latest ideas, techniques and best practice. They will also support Thames Water’s ongoing work to trace unaccounted-for water, including the illegal use of unauthorised and unlicensed standpipes. The water company has been clamping down on water theft in recent months and revealed details of four court cases in which companies and individuals were fined for illegally tapping into supplies across London and the Thames Valley. A separate contract covers a preferred supplier list of five companies: Morrison Utility Services, Teccura, Crowders, Invenio and PN Daly. They will adopt a campaign-based method to leakage detection using innovative approaches to best understand full water usage within specific geographical areas. The individual area issues will be briefed to the five suppliers asking for their proposed solution and financial payment model. The process will be managed by a leakage reduction working group. Gosden said: “Reducing leakage is a top priority for the company and our customers, so it’s vital we have the very best people working on it. Our partners will be challenged to be as innovative as possible to find leaks so we can get them fixed, especially those that are hidden underground and not visible from the surface. In June last year, after an Ofwat investigation found that the Thames board did not have “sufficient oversight and control” of the company’s leakage performance, the regulator confirmed the water company would have to return a total of £120 million to customers for failing to tackle leakage adequately. 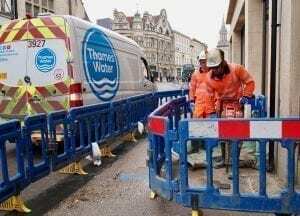 Thames Water said it repaired more than 14,000 leaks in the first two months of 2019. The company claims to spend more than £1 million a day to tackle leakage and improve its customer service. Thames said as part of its £11.7 billion business plan for 2020-25, it has pledged to spend £2.1 billion on increasing resilience and reducing leakage by 15 per cent by 2025, with plans to halve it over the long term. The company is required to resubmit its business plan to Ofwat by 1 April after the regulator placed Thames in the significant scrutiny category when it published its initial assessment of the proposals.